The My Diaper Night is finally here at Wearing Clouds! Vibrant colors, great absorbency, and a superior fit! This diaper is sure to impress even the pickiest of babies! The MyDiaper Night by Save Express is a great imported diaper that Wearing Clouds is proud to bring you! This diaper has been very popular overseas but hardly seen much in the US. Now you have the chance to see why people have been falling in love with this super cute diaper! The MyDiaper Night has bright and bold colors that pop out! Your bottom is sure to be the talk of the town once people see you in these! This amazing diaper features triple stitched elastic leg cuffs, standing leak guards and front and back waistbands. 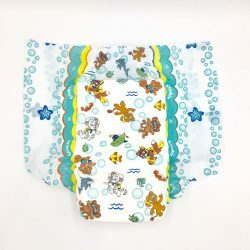 It also has a blue absorbency core to lock in moisture and a honeycomb design in the inner padding to spread out liquid to multiple parts of the diaper. With a capacity of over 4000ml this diaper will not let you down! There are two extra large tapes on each side of the diaper that attach to a glossy landing zone on the front of the diaper. The landing zone makes it easy to remove and reattach the tapes multiple times without losing too much stickiness. Get a MyDiaper Night today! If you are unsure of your size, it is recommended to go based on your hip size. It is always better to go a size up than have the diaper be too small.